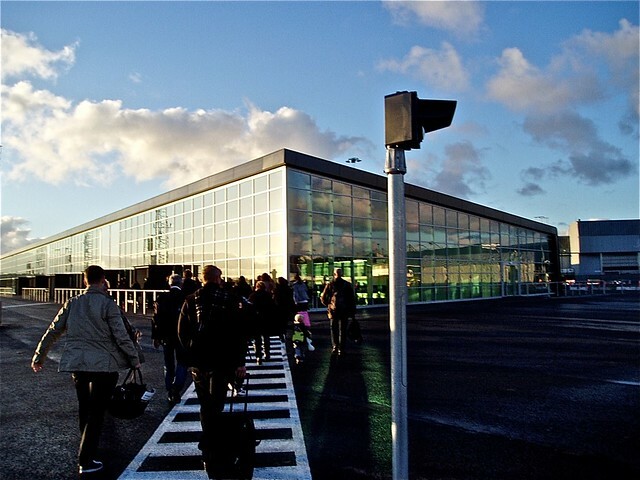 Copenhagen’s lovely, minimalist budget airline terminal. At long last, the debut of my airport critic column appeared in the May issue of Travel + Leisure. Sadly, it’s not going to run as often as I would like and the first one, about Copenhagen’s sweet new budget airline terminal, shrank markedly from its assigned length. Arguably, nothing essential is missing, just gobs of detail. In fact, I am arriving on a flight from Paris Charles De Gaulle to Copenhagen, disembarking at the newest terminal at an airport that prides itself on functionality. Copenhagen’s airport is, generally speaking, a terrific one. The main building, Terminal 2, is as handsome and efficient an example of 1960s modernism as I’ve ever seen, a monumental box with sunlight streaming through a double-row of round skylights. 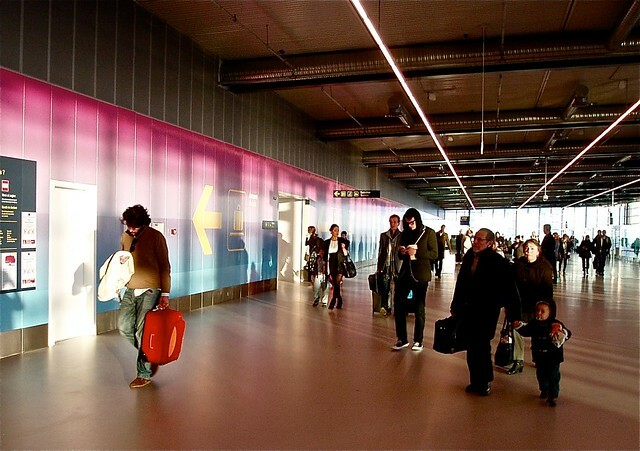 At regular intervals, illuminated signs inform passengers of the waiting time at the centralized security checkpoint. It never seems to top five minutes. Much of the airport flooring is wood, lowering the overall noise level and upping the overall Scandinavian-ness. And even the airport seating – like the iconic blue Ammundsen chair – is exceptionally nice. But the reason I fell for the new terminal –it opened in late October – is because it elevates efficiency to an art form. Just imagine if all airports did that; the world would be a far happier place. CPH Go, designed, built and priced for low cost airlines, is so far served by only one: EasyJet. Founded in 1995, EasyJet flies directly to a number of primary destinations, like Paris and Milan, and scores of secondary cities, some 500 routes in Europe and North Africa. Unlike the legacy carriers, which have cut back in recent years, the budget airline business continues to grow. EasyJet’s 2009 annual report boasts a 3.4 percent jump in passenger load. The airline’s low fare formula (midweek roundtrip fare CDG to CPH: $61) is predicated on aggressive (as opposed to artistic) efficiency: it permits passengers only one small carry-on bag (and no additional “personal item”) which speeds up boarding. And they charge for absolutely everything, including any checked bags ($29 if you pay online, double if you pay at the airport) and in flight coffee ($4). The EasyJet answer to business class is called Speedy Boarding. You pay about $20 extra and they let you into the plane ahead of the masses to grab exactly the seat you want.